The obituaries were published two days before Parkland's one year anniversary. Louisa Angelica Aguilar was 15-years-old when she was shot in her home, rushed to the hospital and later passed away on July 17, 2018, in Littleton, Colorado. Eleven miles away in Denver, Allison Kelly, 18, wrote Aguilar's obituary, entitled "Good morning. Goodbye. Sunrise, then gone." Kelly is one of more than 200 teen journalists who collectively wrote at least 1,200 obituaries for children killed by guns in the U.S. since the Parkland shooting at Marjory Stoneman Douglas High School, which left 14 students dead. The 100-word profiles compiled on a site entitled "Since Parkland" went live on Feb. 12, two days before the one year anniversary of the shooting. 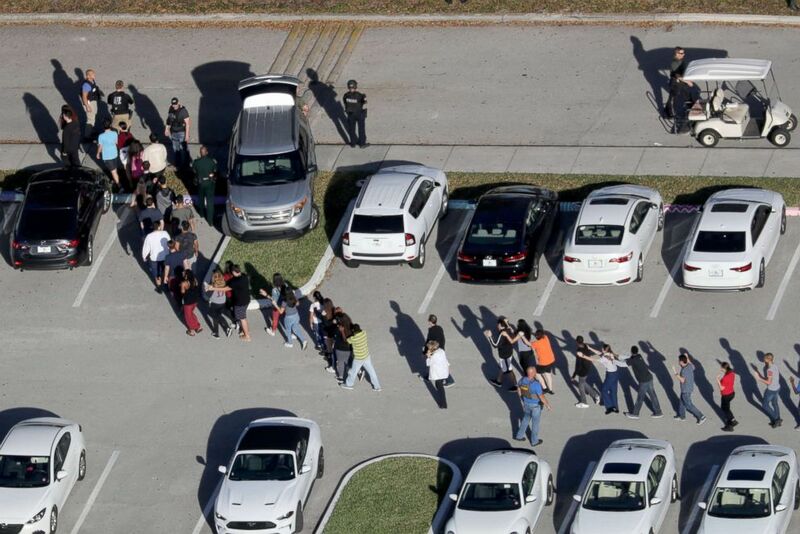 (Mike Stocker/Sun Sentinel/TNS via Getty Images, FILE) Students are evacuated by police out of Stoneman Douglas High School in Parkland, Fla., after a shooting on Feb. 14, 2018. "We all remember Parkland," Kelly and other project student leaders Madison Hahamy, Joe Meyerson, Nadia Ngom and Jimmy Rodgers wrote. "We’re still frightened. Frustrated. Angry. But if this project has taught us anything, it’s that we’re not powerless. We refuse to stand idly by." Student reporters worked in collaboration with the non-profit organization The Trace, McClatchy, and the Miami Herald to "humanize" the statistics surrounding gun violence and memorialize the victims "beyond the tragedies" and "beyond the gunshots in their final hours." Parkland project director and managing editor at the Trace, Akoto Ofori-Atta, compensated the teens for their work and told ABC News she chose student reporters because she believes it "is their story." "Student have to grapple with the threat of gun violence, arguably, in ways that previous generations have not had to," Ofori-Atta said. Many of the "Since Parkland" reporters have been personally affected by shooting threats. Kelly says lockdown drills "are nearly as common as fire drills" at her high school. "Whenever I hear the 'lockdown' chimes on the school intercom, I have to take a deep breath to calm my fear," Kelly said. "I automatically scan for the exit routes of the classroom." Sarah Baum, "Since Parkland" contributor and freshman at Hofstra University, vividly remembers hiding with her teacher and peers in the dark, locked closet of her band classroom during a school lockdown. At the time, she assumed it was a drill. She found out later - miles away, 20 children were murdered by a gunman at Sandy Hook Elementary School in Newtown, Connecticut. 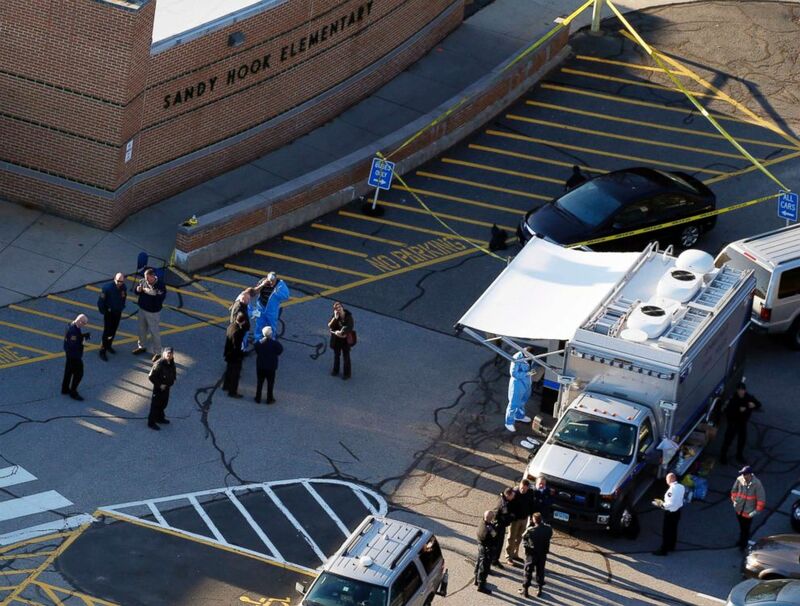 (Julio Cortez/AP, FILE) Officials are on the scene outside of Sandy Hook Elementary School in Newtown, Conn., where authorities say a gunman opened fire inside an elementary school in a shooting that left 27 people dead, including 20 children, Dec. 14, 2012. "Though the threat wasn't real for us that day, it was real for someone else," Baum said. "It was the first time I really became aware of gun violence in America. I never feared getting shot where I grew up." The "Since Parkland" project received its data from the Gun Violence Archive, a non-profit corporation founded in 2013 to provide free access to information about gun-related violence. The high school students used the data as a starting point to research as much information as possible on the victims, including making tough calls to victims' loved ones. "Hearing the mothers, especially, was always heartbreaking," Baum said. "There's something uniquely profound about a mother's grief." Sophia McDermott-Hughes, "Since Parkland" contributor and high school senior, has written obituaries for 25 children. She said the most difficult part of the project has been the "emotional strain." "We feel these deaths in a way that I don't think adults can," McDermott-Hughes said. "Sometime during the 'Since Parkland' project, someone told me, 'The children we write about tomorrow are still alive today.' It hit me like a sucker punch. Who will be tomorrow's victims? Is there really nothing we can do to save them?" The "Since Parkland" project is not complete, with more than 100 "stories left to tell," and more cases coming in every day. The site encourages the public to submit any child they might have missed or correct a mistake.